Jigger infestation of the hands. I picked the least awful picture I could find. Note the deformity of the hands. This person has likely been suffering from infections since childhood. I just learned about probably one of the most horrible dieases I’ve ever seen: the jigger. Tunga penetrans is one of the smallest fleas around, less than 1 mm in length. The gravid female attaches itself to a mammalian host, burrows into the skin head first leaving its read end exposed for breathing and defecation. It feeds on blood from the subcutaneous capillaries and proceeds to produce anywhere from 20-200 eggs. Under the skin it can grow to nearly 1 cm in width. Tunga penetrans is native to South America, was brought to West Africa through the slave trade. In the mid 19th century it was brought on an English shipping vessel and made its way through trade routes and is now found everywhere throughout the continent. Bacteria opportunistically invades the site and super-infections (multiple pathogens) are common. Victims suffer from itching and pain and multiple fleas are common. Due to the location of the bite, people often have trouble walking and due to the disgusting nature of the infection, victims are stigmatized and marginalized. Worse yet, the site can becomes gangrenous and auto-amputations of digits and feet and eventually death are not uncommon. The Parliaments of both Kenya and Uganda have introduced bills in the past calling for the arrest of people suffering from jiggers. Of course, these ridiculous bills don’t come with public health actions to control the disease. Jiggers are entirely preventable, treatable through either surgical excision or through various medications but risk factors for it are mostly unknown and the data contradictory and mostly inconclusive. It sometimes occurs in travelers and is easily treated in a clinic on an outpatient basis but is a debilitating infection for poor communities. Thus, it is not taken seriously by international public health groups who choose to focus on big issues like HIV and malaria. 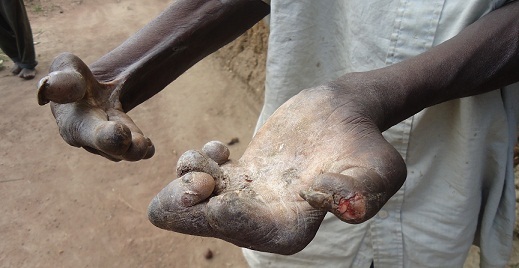 Jiggers are a classic example of the neglected tropical disease: it devastates the poorest of the poor but gets almost no attention from donors or the international press. We gathered some data on jiggers back in 2011 along the coast of Kenya. Without presenting these results as official, I was drawn to the attached map. Animals of various species have been implicated as reservoirs for the disease, most notably pigs and dogs. Less understood is the role of wildlife in maintaining transmission. On the map below, the large yellow dots represent cases. 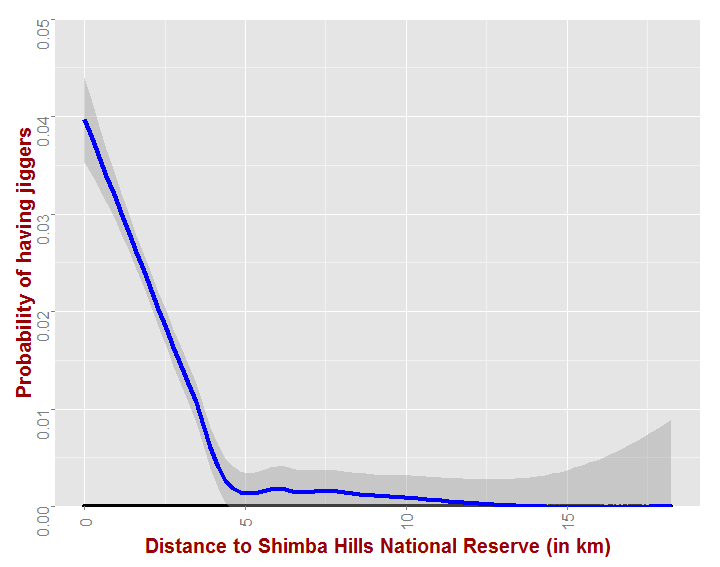 Note that they are nearly all located along the Shimba Hills Wildlife Reserve. I calculated the distance of each household to the park’s border (see the funny graph at the bottom), and found a graded relationship between distance and jiggers infections. Past 5km away from the park, the risk of jiggers is nearly zero. What does this mean? I have ruled out domesticated animals, at least as a primary reservoir. People in this area tend to all own the same types and numbers of animals. Being Islamic, there are no pigs here, but dogs are found everywhere. Despite this, there are distinct spatial patterns which are associated with the park. Note that all of the cases are found between the parks border and a set of lakes, perhaps implying that certain wild animals are traveling there for water and food. The ecology of jiggers is very poorly understood and, like many pathogens (like Ebola, for example), wildlife probably play an important role. It’s worth paying me a lot of money to study it. Locations of jiggers cases. note the proximity to the park. Distance to wildlife reserve and jiggers risk. Note that risk drops until 5km, then becomes nearly zero. We are working on jiggers in schools in Kenya, and this is the first time I have heard of the parliament of Kenya passing a law to arrest people with jiggers. Have you since published this dataset? How would I cite the map and data found on this page if I digitized the image in a GIS? I hear you! It’s a horrible disease, which is horribly neglected. 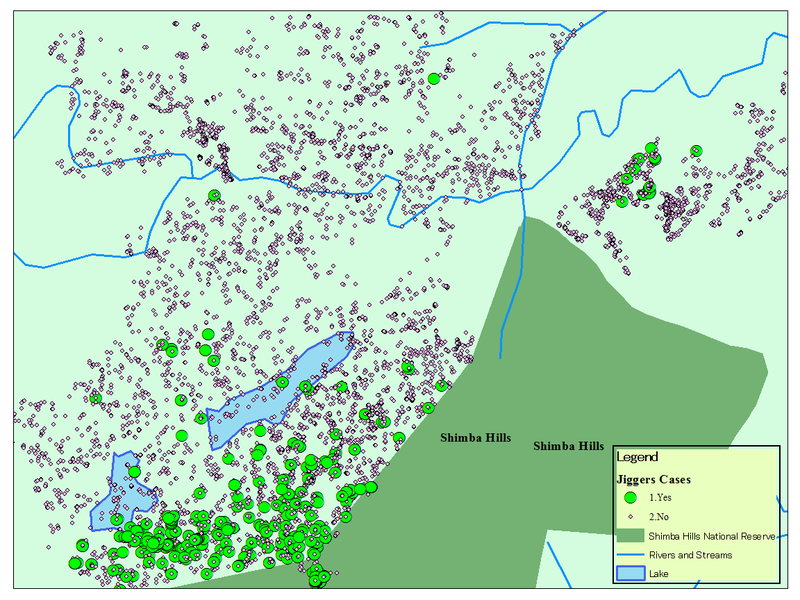 We are mapping and treating it in schools in Western Kenya.